Yesterday I wrote about how Gizmodo got their hands on an iPhone 4G prototype that was apparently left at a bar in Washington state, and then stolen from that location. Apparently, as soon as Apple found out about the missing / stolen iPhone 4G, and that Gizmodo had published a video of the iPhone 4G prototype, they (being Apple) didn’t take very kindly to that. 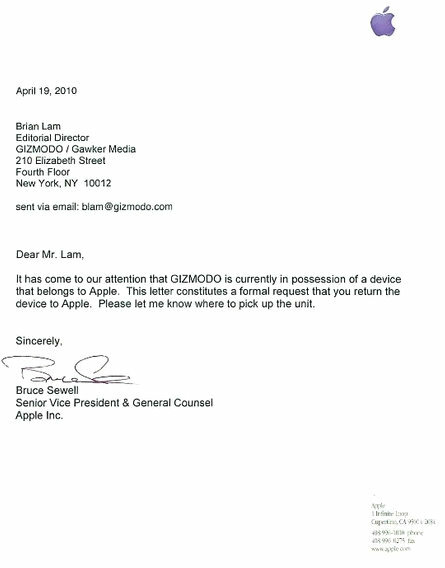 So Gizmodo received a nice little letter from legal counsel at Apple requesting the Apple iPhone 4G be returned to Apple immediately, and to let them (Apple) know where to pick the device up.